This has to be one of the easiest recipes around. I’m all about the quick dinners, but also making them delicious. Growing up we always had go-to’s each week; spaghetti, breakfast for dinner, taco night, stroganoff, sloppy joes etc. Now nothing against my momma, but I do try to make my go-to’s a bit healthier. So we have some of the same staples but swap things out. Like our sloppy joe night. Ground beef in a large pan, drain fat. Dice 1/2 an onion, red or yellow your preference. Add to the beef. Add 1 can of tomato sauce adn 1/2 can of tomato paste. Worcestershire sauce I dash in little bits at a time and stir, adding til I get the flavor I want. Add the salt and pepper to taste as well. Voila! Done! Now you can toss this over a pretzel bun, some flat bread or what I did was wrap it up in a low carb tortilla with some broccoli and cheese, put it back in the pan to toast it a bit…. yum! It was actually really really good! Enjoy! Here’s a quick and easy fav of mine! Really any meat and veggie that you can throw in a pan with some soy sauce and hoisin sauce is my speedy go to. It’s always fast, easy, healthy and yummm. Hear large skillet over high heat. Add sesame oil, and sauté green onions and garlic for about 2 minutes. 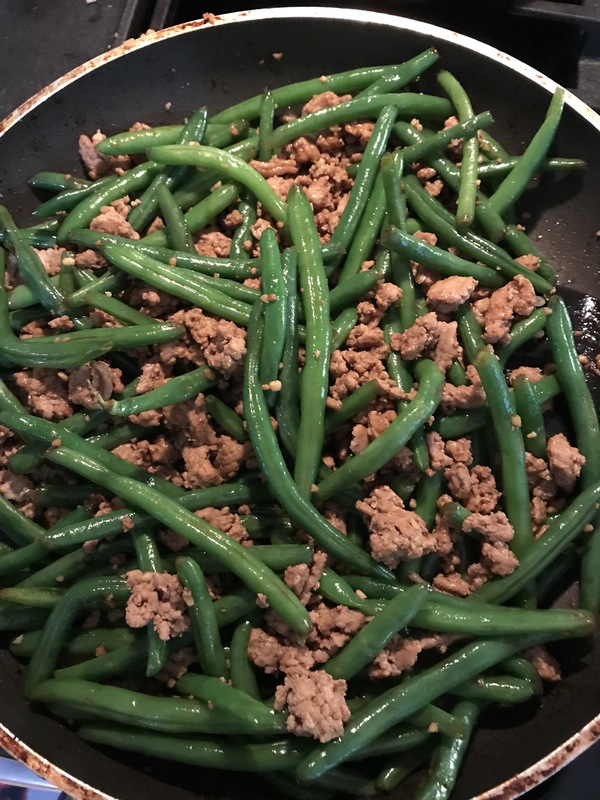 Stir in ground turkey and sauté 3-5 minutes, until meat is mostly cooked. Crumble meat as much as possible. Stir in chili garlic sauce, hoisin sauce, and ginger. 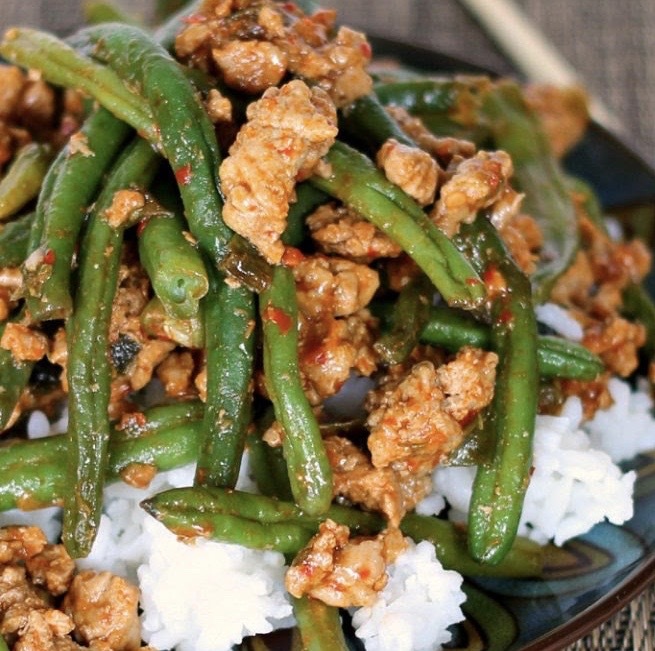 Add green beans and soy sauce. Continue cooking over high heat for 7-10 minutes longer until beans are cooked. Stir in rice vinegar, and cook one minute longer. Serve as is or over rice! *credit to wearychef.com for the recipe idea! When I very first found CrossFit, everything was paleo. I mean, if you weren’t doing paleo then you probably weren’t a real crossfitter (insert eye roll). My then boyfriend, now husband was really big on this too so I figured I better try! I looked everywhere for books, sites, anywhere that help me or give me some decent recipes. It wasn’t like now where you have hundreds for every search you put in. Anyways, I came across “Make it Paleo” and fell in love. Their recipes were simple, few ingredients and they tasted delish! Ryan’s favorite type of cookie is oatmeal and they have the best recipe for it! Full disclosure though, it’s quite the handful of ingredients but once you have them you’ll have plenty for multiple batches. I ALWAYS do a double batch. Also, if you have a Trader Joe’s, I recommend getting everything there, usually the cheapest. 2. In a large mixing bowl combine all of the dry ingredients. 3. In a small bowl mix eggs, maple syrup, vanilla extract and melted coconut oil with a hand mixer. 4. Stir wet ingredients in to dry ingredients. 5. Stir in 1 C raisins. 6. On a parchment lined baking sheet, drop tbps sized amounts of cookie batter. 7. Bake cookies for 12-15 minutes. Sorry I don’t have a real photo, but whenever I make these they disappear SO fast!!! I hope you enjoy them as much as we do!! Need an extremely easy, quick idea for dinner?! It doesn’t get much easier than this! I am all about makin life easier and preparing dinners that really have little preparing at all! During the week days we’re pretty lucky if we’re sitting down to eat by 8pm. Therefore the less work the better and the faster it’s prepared, that’s the best! So here it is, a ridiculously easy version of PF Changs lettuce wraps! 1 8oz can of water chestnuts. 1. Take one large pan and throw your ground chicken in. Cook it on medium heat until it’s full cooked through. Drain the excess fat. 2. While waiting for the chicken to cook, chop your green onions into slices, and dice your chestnuts if they didn’t already come that way. Also take this time to either wash your lettuce if you’re doing full wraps or rinse and chop your lettuce for a lettuce wrap bowl. 3. Chicken is done, you’ve drained the excess fat. Now toss in the full can of water chestnuts. Bring the stove down to low/medium and let cook for about 3 minutes. 4. Add in your sauce. This sauce you can find anywhere, it’s usually in the international section. If you want a thicker result, get 2 bags and drizzle a little over the top when you’re done! 5. After mixing the sauce, making sure it spreads evenly, add your green onions and give it a quick mix and you’re all set! The cauliflower I added for more substance. These big bags you can find at Costco and then inside the big bag are 4 separate serving sizes. Throw it on the stove with a setting to mid/high and cook for about 5 minutes and that’s ready to go too!! Not too bad! If you still need a little something extra, grab some egg rolls from the store and you’ll be all set!